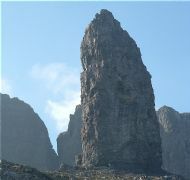 There are many walks in the Skye area. 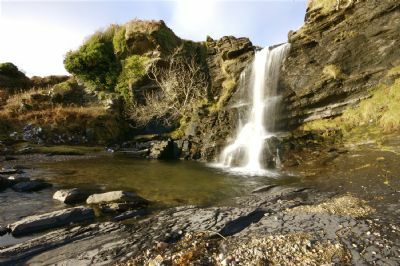 This is the waterfall at Boreraig in the south end of the island. 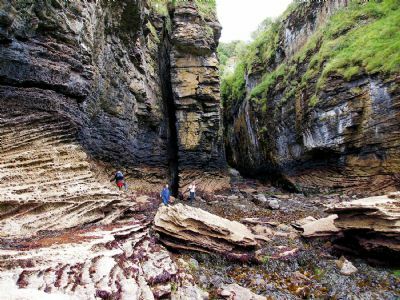 Very popular walk to its base, and striking rock formations all around. 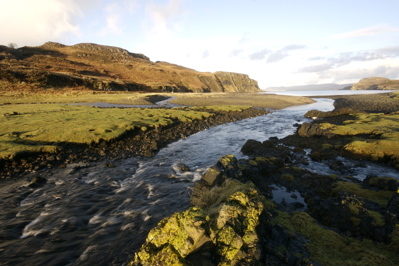 Situated by the road between Portree and Staffin. This is the view from the track to corrie Laggan. 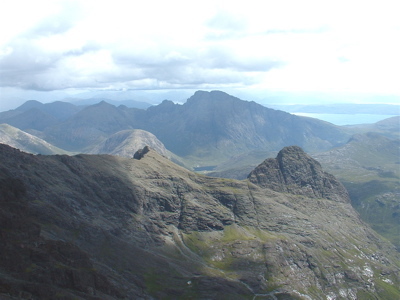 It is one of the most popular walks in the Cuillins and starts from Glenbrittle. 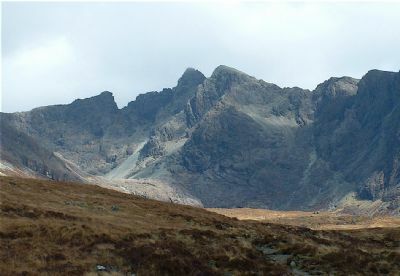 Although corrie Lagan is a beautiful walk the only way of reaching the ridge from here is to scramble up the stone shoot to Dearg or Sgur Alasdair but this is definitely not recommended. Spar cave is a good excursion when the weather is inclement. However it can only be reached at low tide, 1m or lower. You can buy a tide table at the Gun and Tackle shop in Dunvegan. 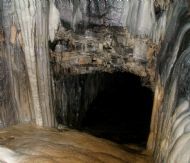 Spar cave is notoriously difficult to find. Take the road to Glasnakillie from Elgol and on reaching the T junction by the telephone box turn right. After about 100 metres park up on the grass by the passing place on the left near an old stone byre. 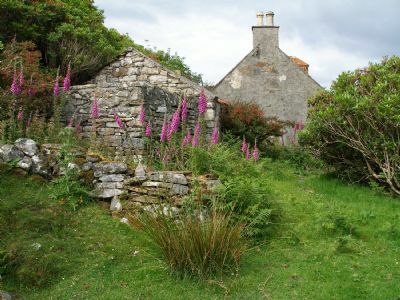 Walk through the five bar gate and follow a track to the right of the byre downhill through a shallow gulley. Follow the track through the bracken until you reach the cliff top and trees. Turn left and after a short way you will notice a path on your right which winds down the cliff through the trees to the shore. 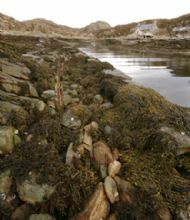 On reaching the shore keep to the left scrambling over the large rocks exposed by the tide, bear left and turn into the geo. Spar cave is at it's head. There is a stone wall across the entrance to the cave with an opening in. 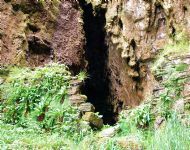 In Victorian times there was a door here and visitors were charged admission. Take the passage on your left and almost immediately you will meet a steep slope of calcite flow leading upwards.The cave is unusual as you have to climb up into it.You will need boots with a good grip as the surface is always wet. Keep to the ridged areas. 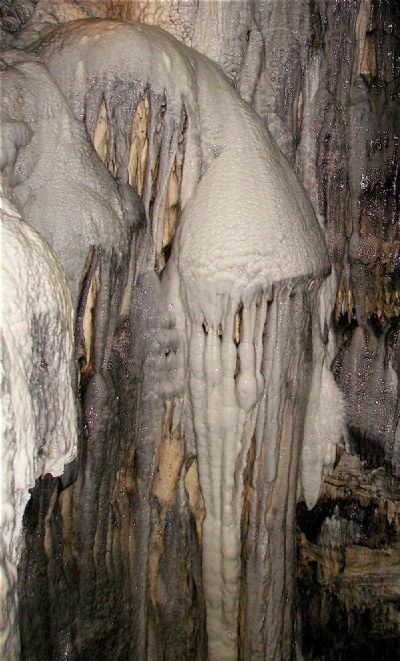 The steep climb is worth it for when you reach the plateau at the top you are surrounded by some amazing stalactites and stalagmites and can look down into a crystal clear pool. It goes without saying that you will need a good torch. 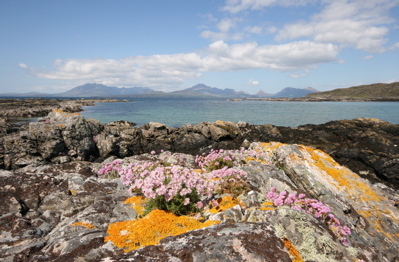 There is a good walk in the south of the island from the Aird of Sleat to the Point of Sleat. The walk is on a well maintained track. To find an exquisite white beach take the signed narrow path to the left before you reach the wee harbour. 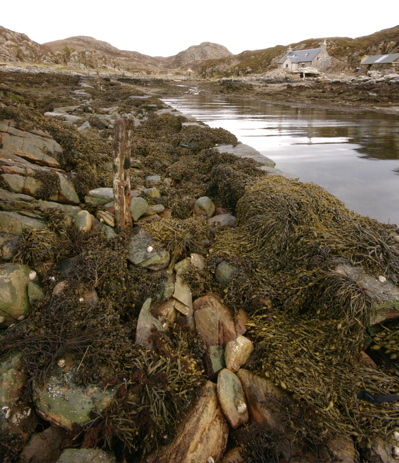 This old harbour is at the end of the track to the point of Sleat. It is quite impressive and must have been an important herring fishing station at one time. 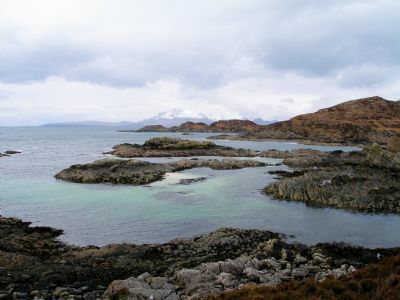 Diabaig is a lovely quiet bay where we have seen otters. 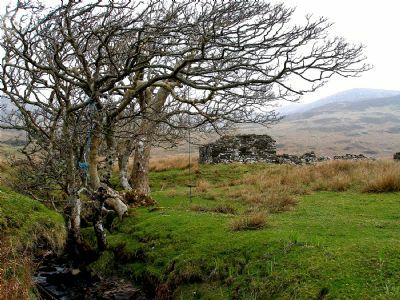 Park by the trade entrance to Greshornish House Hotel and follow the track on your left to a copse of beech trees then bear left through a gate and follow a grassy path to the shore. (very wet in places). 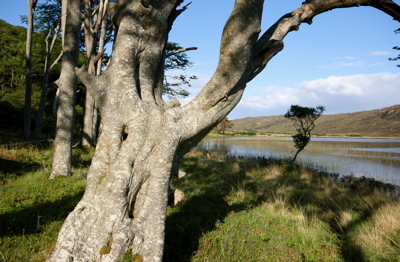 The walk to Dalavil is a beautiful walk in the south end of the island. Go to the Sleat peninsular and turn right on the Tarscavaig road just before Armadale after about two miles you will see a barriered track on your left.Walk down this track, which turns into a path largely following the burn for four miles and you will reach the woods at Dalavil.It is a mixed 18th century planting of beech and scots pine, original sessile oak and holly.It is deer fenced to encourage regeneration.You will have noticed extensive deciduous planting on your way by the MacDonald Lands Trust. 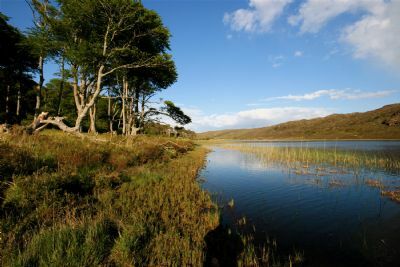 Walk through the woods at Dalavil and out the other end, another two miles will take you to the beaches at Dalavil bay. 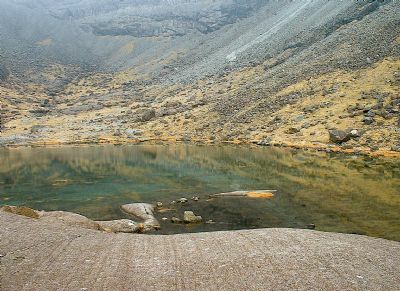 Otters, peregrines, deer, divers have been seen here. 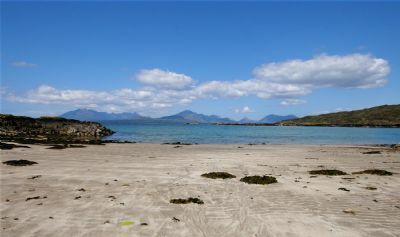 One of the best views from a beach on Skye.